So, what social media platform should you use, what should you post and how can you make your business stand out in your industry? See our infographic below to find out. When choosing which platforms to focus your business’ social media efforts on, there are many factors to consider. From the demographic of consumers in your industry to the platform best suited to your content, do your research and begin by focusing on just one. Here are six of the biggest and how you can use them effectively. The Facebook mobile app gets 1.15 billion mobile users every day. Respond to all customer correspondence, such as messages and comments. You’ll be rewarded with a “Responsive” badge by Facebook if you get back to customers quickly. Avoid using hashtags—they have little to no effect on post visibility on Facebook. If you want more reach, the platform’s paid features offer extensive targeting options. 60% of top brands use a consistent filter. Pick one that fits in best with your brand and use it for all your posts. 31% of American women use Instagram compared to only 24% of American men. Tweets with 1–2 hashtags get 21% higher average engagement. Use Buffer or Hootsuite to schedule tweets for when your followers are online. Don’t use automated messages to reply to followers. Be reactive with trending topics, and use hashtags, but keep them relevant to your brand. Do schedule tweets for times when your followers are most active—try Buffer or Hootsuite. Create custom thumbnails for your videos. Title cards can help attract users to your video with important info. Encourage subscriptions with overlays to direct users to other content on your channel with custom “end screens” that link to other videos. 20% of the people who start your video will leave after the first 10 seconds, so make your intro short or immediately engaging. 65% of Pins lead to product sites like Etsy, Amazon and eBay. Pin content from other users and influencers to engage with the community in your niche. Ensure all the images on your website are easily pinnable by others. Using a Pinterest widget on your site to add “Pin It” buttons to your image will increase mentions. Don’t add personal connections to your company marketing email list—it’s unprofessional. Engage with relevant content from your industry, and share your expertise to build up your “influencer” credentials with other professionals. Uploading a professional LinkedIn photo gets you 21x more profile views and 36x more messages. 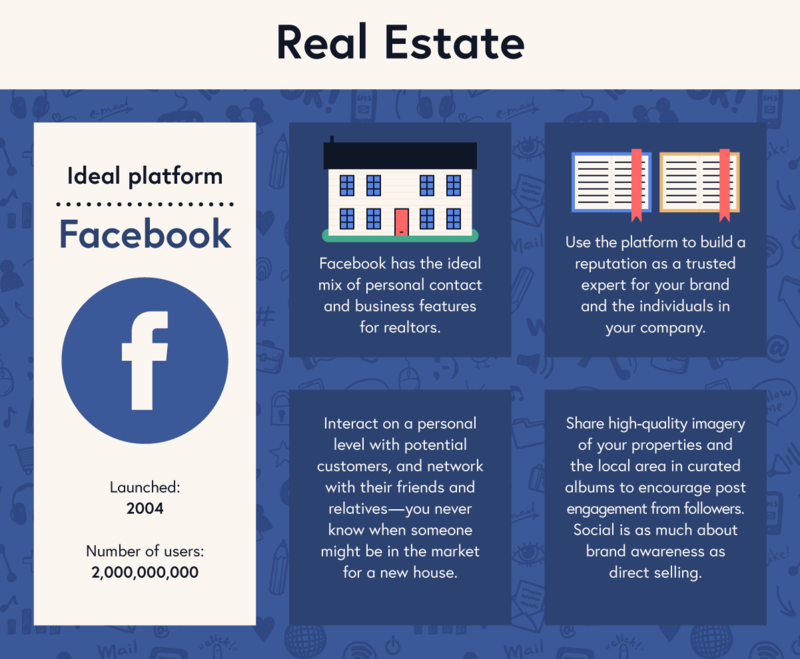 Facebook has the ideal mix of personal contact and business features for realtors. Use the platform to build a reputation as a trusted expert for your brand and the individuals in your company. Interact on a personal level with potential customers, and network with their friends and relatives—you never know when someone might be in the market for a new house. Share high-quality imagery of your properties and the local area in curated albums to encourage post engagement from followers. Social is as much about brand awareness as direct selling. 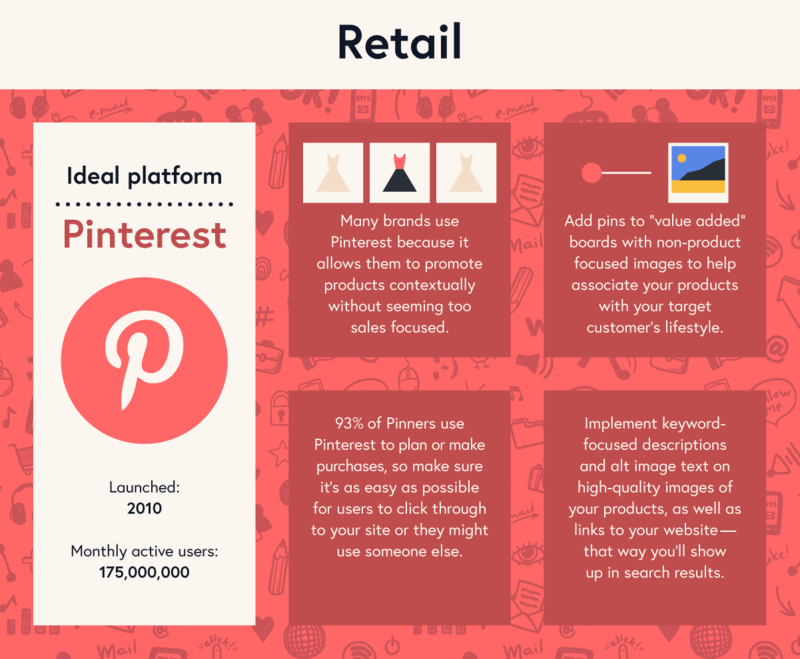 Many brands use Pinterest because it allows them to promote products contextually without seeming too sales focused. 93% of Pinners use Pinterest to plan or make purchases, so make sure it’s as easy as possible for users to click through to your site or they might use someone else. Add pins to “value added” boards with non-product focused images to help associate your products with your target customer’s lifestyle. Implement keyword-focused descriptions and alt text on high-quality images of your products (as well as links to your website)—that way you’ll show up in search results. Concentrate your efforts on Facebook and Instagram, rather than a website, so you can regularly update and post high-quality imagery of your food to attract customers. 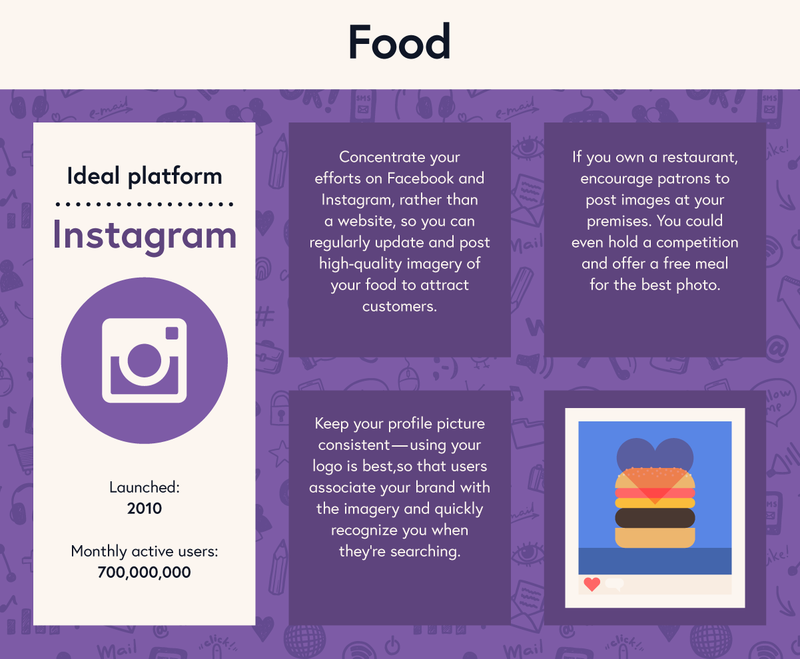 If you own a restaurant, encourage patrons to post images at your premises. You could even hold a competition and offer a free meal for the best photo. Keep your profile picture consistent—using your logo is best so users associate your brand with the imagery and quickly recognize you when they’re searching. Use Twitter to share expert insight and comments, but make sure you follow social media guidelines. See the New York State Bar Association for more information. Follow hashtags and influencer accounts to ensure you’re up to date on recent cases and events—you might spot a news story you can comment on. 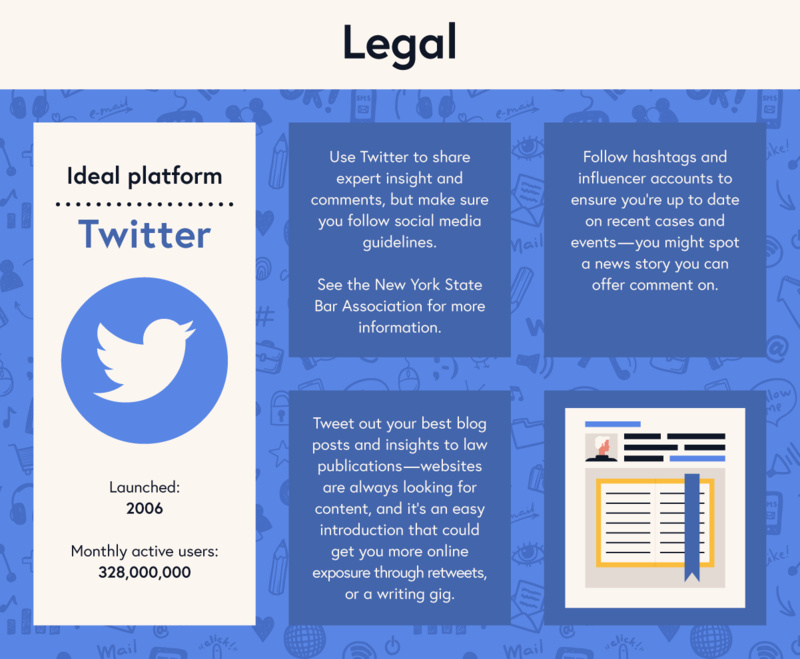 Tweet out your best blog posts and insights to law publications—websites are always looking for content, and it’s an easy introduction that could get you more online exposure (through retweets) or even a writing gig. 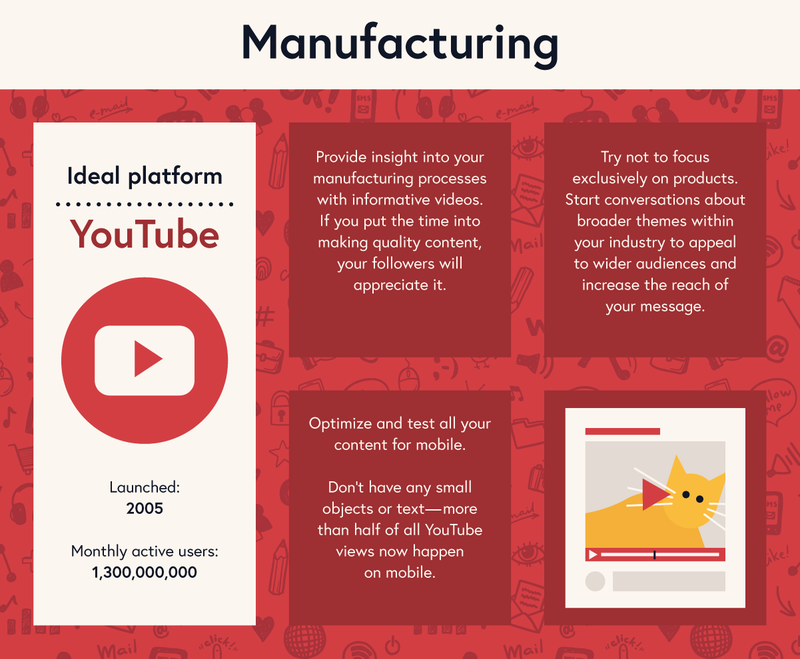 Provide insight into your manufacturing processes with informative videos. If you put the time into making quality content, your followers will appreciate it. Try not to focus exclusively on products. Start conversations about broader themes within your industry to appeal to wider audiences and increase the reach of your message. Optimize and test all your content for mobile. Don’t have any small objects or text—more than half of all YouTube views now happen on mobile. Do you have any business tips for social media? How do you get the most from your posts? Let us know on Twitter @TFFSocial.